Today the focus will be on a specific part of the League of Legends map, the Jungle. The Jungle is the space between the lanes and the river. There are four different sections of the Jungle formed by the X that the River and the middle (mid) lane create. Each of the four sections contains three monster camps. Each section has a few names in the game. The top section is called purple top because it is close to purple’s top lane. The right section is called purple bottom (bot) Jungle for the same reason. The bottom section is called blue bot and the left section is called blue top. The sections have other names that are used more often that refer to the specific monsters within them, so lets take a look at those. Purple top and blue bot are mirrored and contain the same three monster camps in identical places. The central camp is the Lizard Elder and his two Lizard buddies. The Elder attacks with his nasty sword while the little Lizards shoot fire from their staves. The other two monster camps around the Lizard Elder are the Golems and the Wraiths. The Golems are two big rocky brothers. One is an older brother and is thus bigger than his younger brother. The Golems attack you by smashing you with their rock hands. The Wraiths are four ghostly looking things. One of the Wraiths is bigger than the other three. The Wraiths attack by shooting out little ghost lights from their hands. The purple bot and blue top Jungle sections are dominated by the Ancient Golem at the center who also has two Lizard buddies. The Ancient Golem is the huge father version of the two Golem brothers in the red side Jungle. The Lizard buddies are just like the two that hang out with the Lizard Elder. When a player kills the Ancient Golem he receives a buff, just like with the Lizard Elder. The Ancient Golem’s buff has blue runes instead of red runes. The player with the blue buff can use more of their special abilities and can use them faster. The blue buff gives these sections of the Jungle their name, blue side Jungle. Just like with the red side Jungle, the two sections are differentiated by which side of the river they are on, our side or their side. The two monster camps around the Ancient Golem are the Wight and the Wolves. The Wight is a recent addition to the Jungle. The company that makes League of Legends, Riot Games, updates the game all the time with significant updates at the beginning of every year. 2014 saw the addition of the Wight to the Jungle along with a few other things. The Wight is all by it’s lonesome in the Jungle. It is bigger than all the other Jungle monsters except for the Ancient Golem and the Lizard Elder. The Wight looks a lot like the Wraiths and attacks in the same way they do which is why the Wight is sometimes called the Big Wraith. I find this a little confusing because there already is a big Wraith in the Wraith camp itself. I’ll keep calling it the Wight and hoping that everyone else changes. The Wolf camp has three Wolves, a mama Wolf and two baby Wolves. You can call the baby Wolves Romulus and Remus if you want. The Wolves attack by biting (obviously). The monsters are a lot like minions, but different in key ways. Minions walk down the lanes, but if attacked will follow the attacking player out of the lanes. The monsters don’t leave their camps. If you hit them and lead them away from their camp, the monsters will head back to the camp and quickly return to full health. Minions spawn every thirty seconds. The monster camps only respawn if all the monsters in them are killed. The respawn times are 50 seconds for the Golems, Wolves, Wraiths and Wight, and 5 minutes for the Ancient Golem and Lizard Elder. The monster camps do not respawn until all the monsters in them are killed. This allows a clever player to kill the Ancient Golem or Lizard Elder on their opponent’s side and waltz away with the buff, leaving the Lizard buddy scraps for the other team to have. 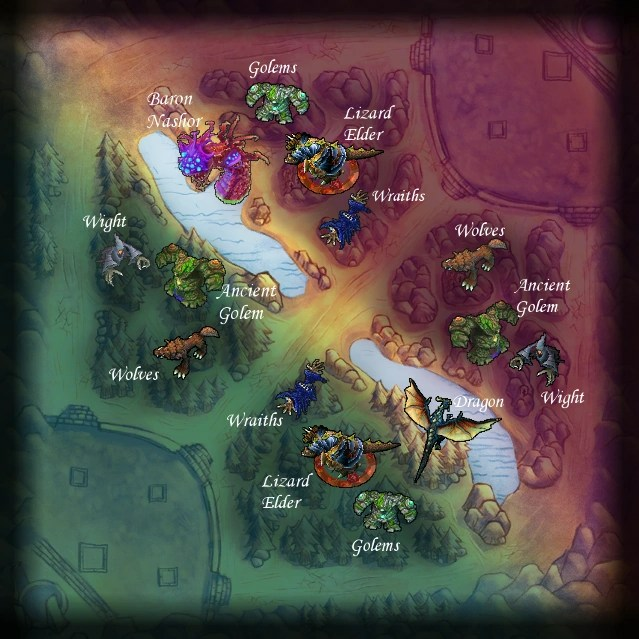 There are two more monsters on the map above, Baron Nashor and the Dragon. Those two are different than the other monster camps, so I will describe them another time. There’s a lot more to tell you about how the map is played, so I hope you keep reading to learn it all!